The massive body of the Rottweiler is thick and muscular. They are usually classified as a medium to large sized dog. The colors are dark and usually black, with a black coat and even a dark mouth cavity. The color pattern is a coppery brown spotting above the eye and down around the snout and chest. The rusty brown coloring is also present on the paws and lower legs. They have a broad thick head, and a muscular neck. The average weight of males should be around 95 to 130 pounds and for females around 85 to 120 pounds. The powerful frame of this dog makes it a good hunting and gathering companion. This breed is known for being a perfect work dog and has been used for police and rescue training and working with the disabled. The Rott is a hard working dog and enjoys pleasing the masters needs. They are loyal to their owner and will fight to protect them. They have a strong minded personality which will make this dog a great guard dog, especially for people with a farm or livestock. Back in the beginning of the 19th century, this breed was primarily used as working dogs with livestock. They were used to help herd and transport livestock, sometimes bringing it back to the local market. In fact, they are one of the most well known and oldest type of herding breeds. This breed is also known as the butcher's breed because these dogs were used to carry meat to the markets and they also were attached to carts which allowed the dog to pull a large amount of meat at one time. The history of the breed dates back to the Roman Empire. However the demand for this type of dog increased during World War I. Eventually they were used as service dogs in the police and military through World War I and World War II. The dogs played various roles, from messenger to guard. The first Rottweiler club was founded in Germany in 1914. The SDRK, or South German Rottweiler Club was the first of its kind. However, the American Kennel Club didn't recognize the breed until 1935. A year later, the breed was showcased at Crufts in Britain. Eventually a specific Rottweiler register was opened in 1966. The American Kennel Club reported the breed as the most registered dog in the mid 1900s. Rottweilers need extra exercise because of their large muscular bodies. They are a larger breed of dog therefore they will need more space to run and be active. Daily walks or a game of fetch is mandatory to keep these types of dogs lean and healthy. Swimming or running are ideas that are very fun for the dog and is great for their health. They can live in an apartment although it would be best to have a small yard for a stretching area. This type of dog needs socialization and interaction. The Rottweiler is an interactive dog, that wants to be a part of a working pack as their natural instinct. Working and training this type of dog is easy and fun because they want to learn and to be taught. Rottweilers love to be outdoors and being playful, they especially enjoy playing with their masters. The Rottweiler gives off an obedient yet strong disposition. The dogs appear to be calm yet confident. Other characteristics that stick out among this breed is their willingness to work, loyalty, and intelligence. They have a natural genetic-instinct to stand tall as a herding dog but also carry guard dog qualities. This can strengthen the relationship between dog and man but can also be seen as potentially dangerous if the owner is irresponsible or negligent. When purchasing a dog, it is important that you understand the great deal of responsibility that is associated with it. You are not just purchasing a dog for yourself. You have to think about the quality of life for the dog, the environment you're putting it in, and how it interacts with others. 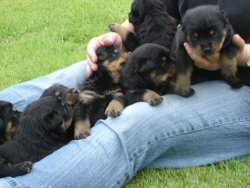 Overall, Rotts are a relatively healthy breed of dog. They are not inherently prone to any certain types of disorders. Although there have been many with hip dysplacia noted, it is not a significant number of dogs in relation to the number in existence. 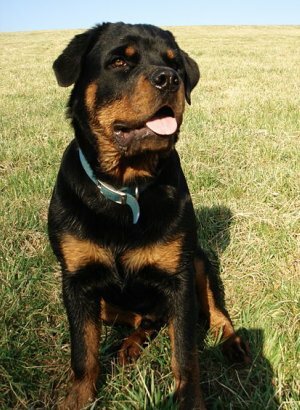 Rott pups are more prone to getting infected with a parovirus than any other breed, which is a highly contagious and sometimes fatal infection. It is not fully understood why they are more prone to this infection, but there is a vaccine present to help prevent this infection from spreading.